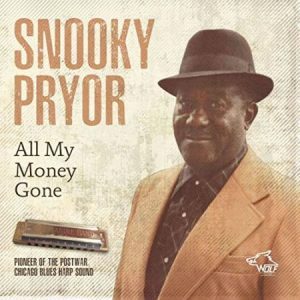 “Pioneer of the Postwar Chicago Blues Harp Sound.” So proclaims the cover of All My Money Gone, a masterful compilation of previously unreleased recordings from the one and only James Edward “Snooky” Pryor. 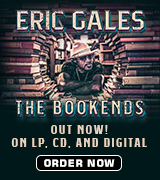 Promoted and released by Wolf Records International, it features over an hour of blistering blues: six originals and eight classic covers, including Tommy Johnson’s “Big Road Blues,” “Ain’t That Just Like a Woman” by Claude Demetrius and Fliecie Moore, and a gut-wrenching version of Richard M. Jones’ “Trouble In Mind.” These tracks were first recorded in October 1979 in Austria. That makes them exactly – well, my age. Don’t dismiss them as old. Rather, think of them as “retro,” or “old but cool” (Wreck-It Ralph). That’s what they are, and the more you listen to them, the more these pure blues doubloons will shimmer. Songs 1-6, 7, 8 and 11 were recorded live in Austria by Ulrich Hahn. Songs 9, 10, 12, 13 and 14 were recorded at Heinz Studios in Vienna by Heinz F. Reitenauer. According to my father, a blues aficionado if there ever was one, Snooky claimed to be the very first musician to have amplified his harmonica, playing it through the PA system at the base where he was stationed. Snooky made his first recording, “Telephone Blues,” with guitarist Moody Jones, also in this CD! Later, he made singles for J.O.B., Parrot and Vee Jay Records. In 1963, Snooky left the music business and moved to Ullin, IL, where he worked as a carpenter, but returned to the scene in the early ‘70s, and toured and recorded in Europe, mostly with his friend Homesick James, who is also featured here. He passed away on October 18, 2006. Complementing Snooky to magnificent effect are Homesick James and Hans Dujmic on guitar, and Fritz Ozmec on drums for track two. Pryor himself is his level best on vocals and harp. The title track and these two Snooky originals showcase him at his finest. Track 02: “All My Money Gone” – This song was originally done by Roosevelt Sykes, but who among us isn’t familiar with the situation? 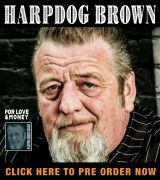 “ALLLLL MY MONEY GOOONE,” Snooky practically screams, his pipes stretched upon the proverbial rack, “and I’ll soon be gone myself.” If a newcomer to the genre ever asks you what Chicago blues is, play this masterpiece. Track 04: “I’m Gonna Call Up My Baby” – A slow burner that sizzles with Snooky’s trademark voice, number four is an ode to red-hot lust. Homesick James stars on guitar, and it blazes just as brightly as Pryor’s harp. The lyrics are hard to understand, but the bottom line is crystal-clear. Track 05: “Boogie Twist” – A bit faster and a lot more danceable, “Boogie Twist” combines Chicago blues rhythm with Chuck Berry style. “I’m gonna get you boogie-woogie if it takes me all night long,” “Lookie there, lookie there!” he exults in the middle of the song, and we’re looking, all right – with our ears if not our eyes. Even if you’re saying All My Money Gone, purchase this piece of Pryor perfection posthaste!